I’m doing dishes in the kitchen when all the sudden I hear the saddest, most piercing cry come out of 4 month old Valentine. Slightly panicked, I ask Eric what happened, and he said, “I kissed her.” Oh the drawbacks of having a beard. This actually happens all the time. Poor baby faced Valentine! Anyway, when I got home both of my big toes were killing me, and since then they have developed dark bruises underneath my nails. You know what this means, right. Get new shoes? Learn how to run the right way? No. Listen people, it’s a sign. The sign says DON’T EVER GO RUNNING AGAIN KAREN. Instead, eat alllll the sugar cookies. I’m super excited to share this recipe with you guys today! I’ve been working on this post for a while now. The recipe is adapted from my sister-in-law Sandi. I wrote it down in pencil in a notebook years ago and have been tweaking it ever since. They are good sugar cookies, for sure, but I was on the hunt for a secret ingredient that would make them next-level. Recently Mel from Mel’s Kitchen Cafe posted these White Velvet Sugar Cookies, which has cream cheese in the dough. I was super excited to try cream cheese in my recipe, and it worked out beautifully. The cookies are tender and soft and have a delicious flavor with a tiny bit of a tang from the cream cheese. I tested this recipe a few times and didn’t make frosting every time, and I enjoyed the cookies all by themselves. They are sweet but not overwhelming. (The frosting takes care of that.) They have tons of flavor from the butter, and almond and vanilla extracts. 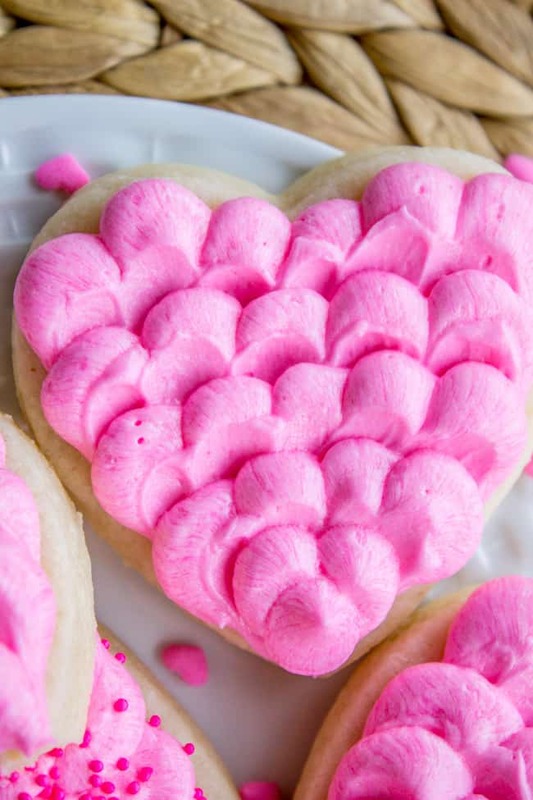 I researched a bunch of my favorite blog’s sugar cookie recipes for sugar cookie tips, because I’m actually kind of a newbie at this sugar cookie business. Kristyn from Lil’ Luna suggested on Instagram stories the other day (I’m a little obsessed with Instagram stories, anyone else??) that sugar cookies ought to be rolled out to about 3/8 inch so that they are nice and thick when they go in the oven. I’ve never rolled them that thick before and it made a huge difference!! This is 3/8 inch. Thiiiiick. Don’t forget to put some flour on your cookie cutter. On the right: I use my finger to get the excess flour/dough off the outside of the cookie cutter. I used a knife to get it out of the corners of the shamrock. I like to use a pastry brush to get the flour off the tops of the shaped cookies. The one on the right is already baked. It still looks like a shamrock! Here’s another example. Snowflakes, not snow blobs. On the left: this is half the dough rolled out. On the right: all the cookies from an entire batch. How many you get depends on what shape cookie cutters you use. Here’s the bottom of a baked cookie. It’s not browned at all and okay, okay, you may want to let it go a minute or two longer than this, especially if you plan to gift them to someone (as opposed to eating them over the kitchen sink, which was my plan for this cookie.) Also, do you see that dark spot in the center of the cookie? Perfectly under baked. Yum. Are you an expert with sugar cookies? 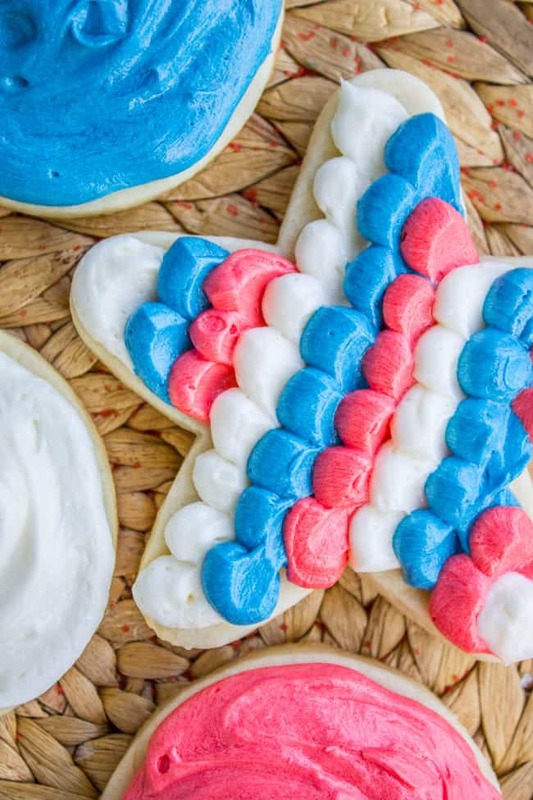 Do you have any other tips for amazing sugar cookies? SPILL! 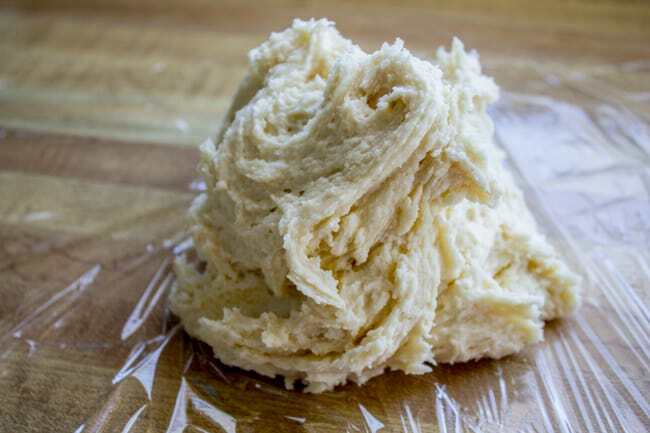 In a large bowl or stand mixer, beat the butter on medium speed until it is soft and fluffy, 1-2 minutes. Add the softened cream cheese and continue to beat for 1 minute, until well incorporated. Add the sugar and beat well, 1-2 minutes, until fluffy. Add the egg, vanilla, and almond extract. Beat well. Scrape the sides and bottom of the bowl with a spatula. This is my spatula that I love and use for every baking project. Add salt and flour and beat until just barely combined, scraping the sides and bottom again. Do not stir too much or you will make your dough tough. The dough is pretty sticky! When the dough is completely chilled, preheat oven to 350 degrees F.
Line 2-3 baking sheets with silpat baking mats or parchment paper. If you have not already split the dough in half, do so now. 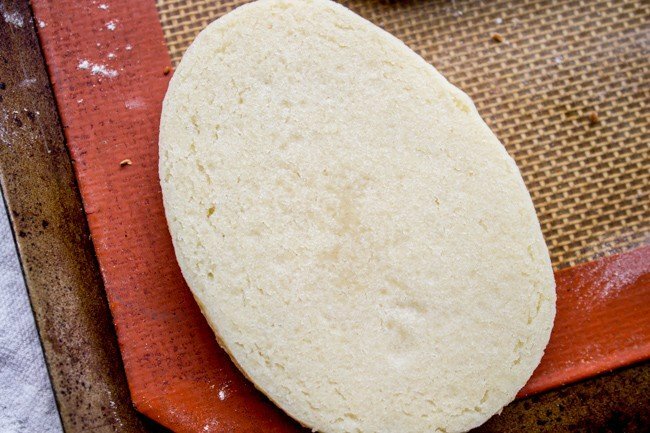 Put any dough that you are not working with in the fridge. Use floured hands to flatten out the dough a bit, then use a rolling pin to roll it and smooth it out a little bit. Don't go too crazy here, remember we want the cookies to be THICK, about 3/8 inch. I actually busted out the measuring tape for this step. No crisp cookies, please. 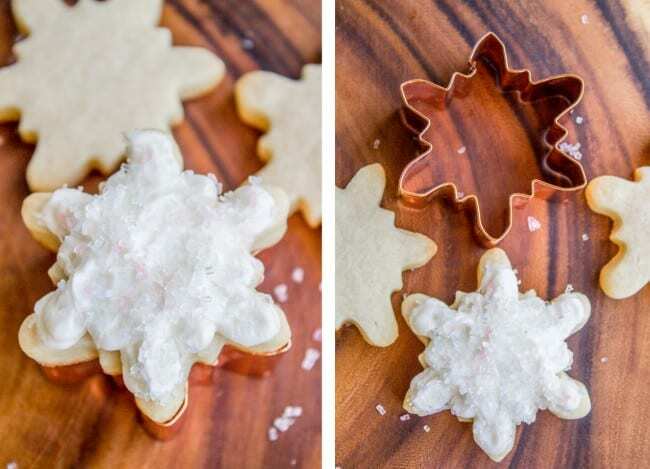 Lightly dust your chosen cookie cutters with flour. Press firmly into the dough, utilizing your space wisely. Use your finger or a knife (depending on the shape) to wipe away the excess flour/dough on the outer edge of the cookie cutter before pushing them out onto the pan. This helps you get clean lines. Place the shaped dough on the prepared baking sheet. If you are using multiple cookie cutter shapes, bake all of the same shape on the same pan. Otherwise your smaller cookies will get over baked. Leave at least 1 inch in between each cookie. 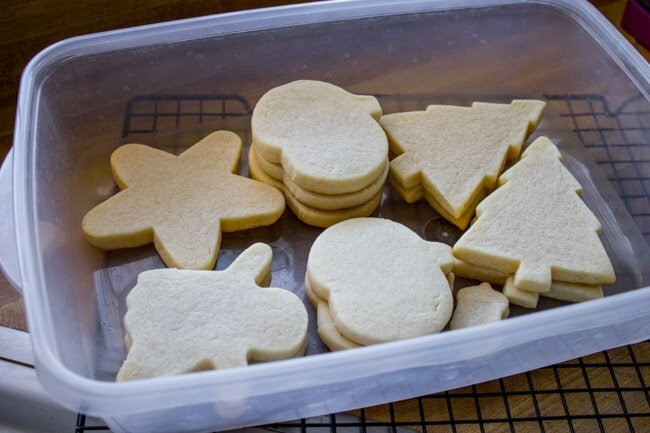 If you've taken long enough that your shaped cookies are no longer chilled, place the baking sheet in the fridge or freezer for a couple minutes. Scrape together the excess dough and knead it together once or twice (as little as possible), then roll it out again to 3/8. Don't overwork the dough! (It will get tough.) Continue until the dough is gone. Refrigerate the dough as necessary. They should go into the oven cool. Bake the shaped cookies at 350 for about 9 minutes for smaller cookies, and about 10-11 minutes for larger cookies. Do NOT over bake. You do not want the edges or tops to brown at all. The cookies should be barely browned on the bottom. See photos. Leave the cookies on the pan for 5 minutes, then immediately transfer to a large tupperware and cover until they are completely cooled and you are ready to frost. 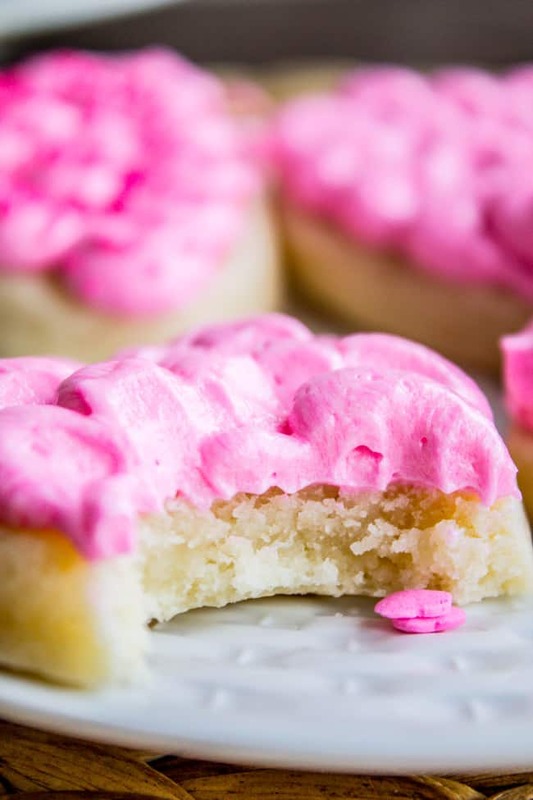 Frost cookies with The BEST Buttercream Frosting for Sugar Cookies! *Several tips I read said to roll out your cookies in between sheets of parchment paper, that way your cookies don't get dried out from too much flour. I didn't think the flour was a problem, but try it out if you want! More frosted cookies you will love! 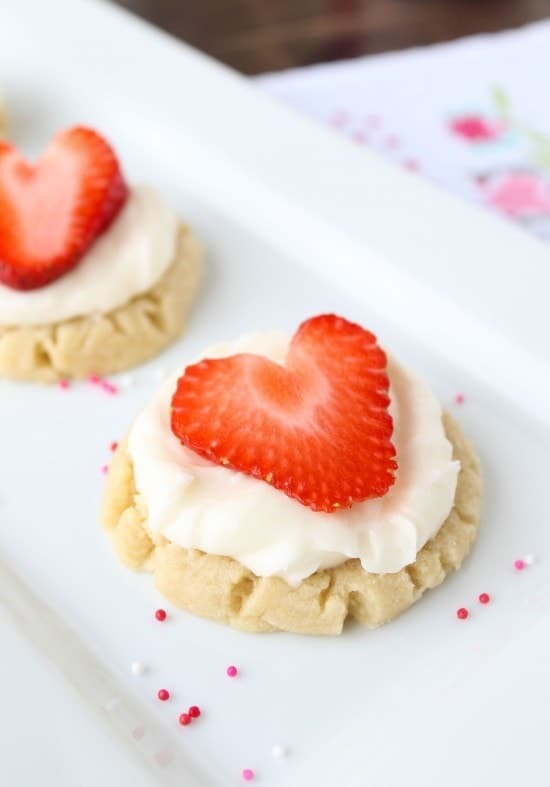 Coconut Frosted Sugar Cookies with Strawberry Hearts << if you are desperate to make today’s recipe before I post the buttercream frosting on Friday, use this frosting. It’s amazing. 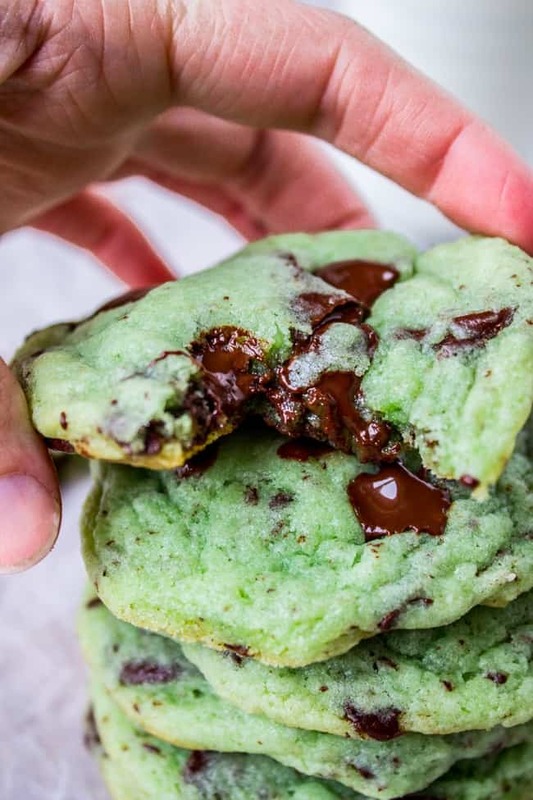 Mint Chocolate Chip Cookies << these are one of the top recipes on my site! 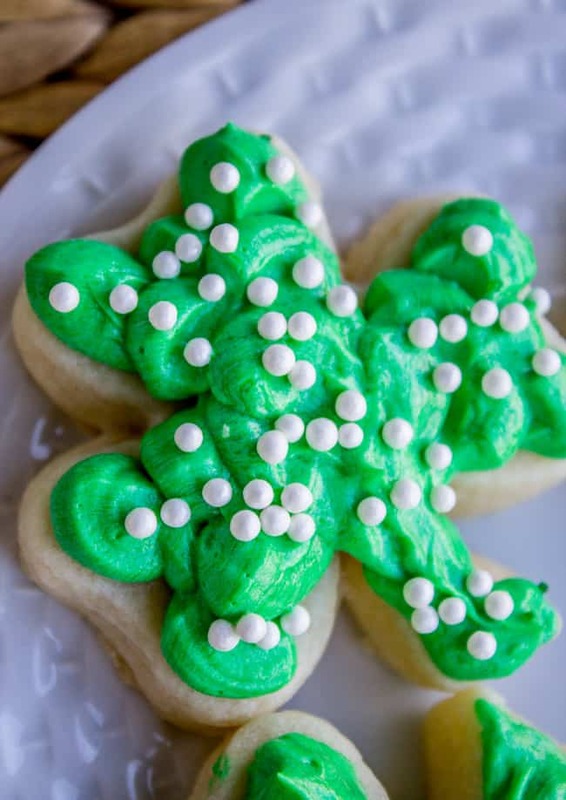 More sugar cookie recipes for you to check out! This recipe is a keeper!! I never made cut out sugar cookies because all the ones I’ve had before never tasted good at all. 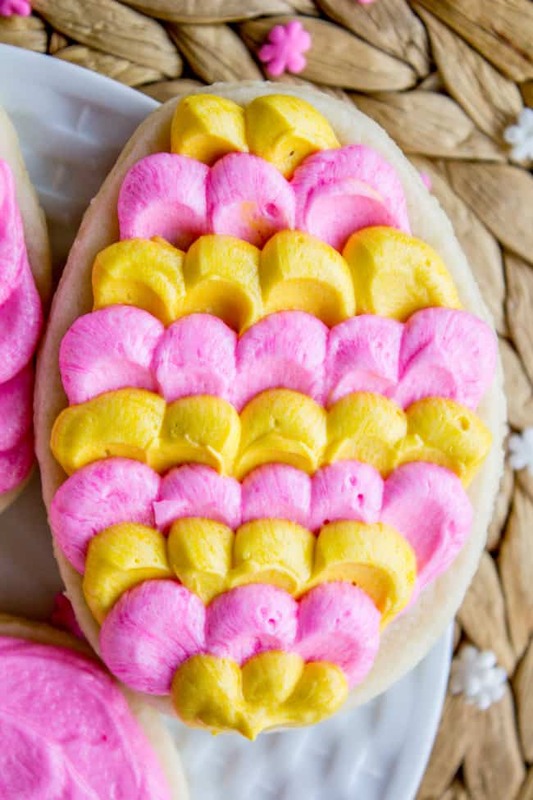 These are some delicious sugar cookies. LOVE the flavor and they turned out so soft. I followed the exact recipe except only put it 1tsp of almond extract instead of 1 and 3/4 tsp. They hold the shapes perfectly too. Thanks for my first great sugar cookies experience. 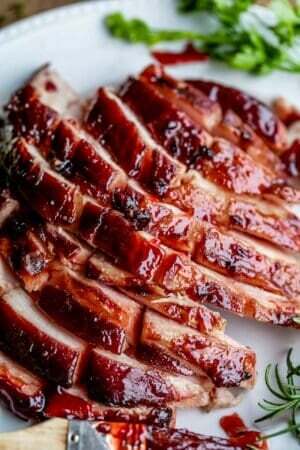 I’m so happy to hear how much you love the recipe Linh! Crunchy or dry sugar cookies are such a disappointment. Thanks so much for the helpful review! I made the cookies exactly as in the recipe. They were delicious! However I want them a little less sweeter. If I cut back on the sugar should I replace the sugar with flour? Or just cut back on the sugar? Hey Leticia! So sugar actually plays a few different roles in cookies, it’s not just the sweetness they add. So just be aware that messing with it too much is going to change the nature of the cookie. I would say start by decreasing the sugar by 1/4 cup or so and see how it does. Or maybe even 1/3 cup. Let me know how it goes! I see there is no baking soda or powder. Is this right? They sound like they are turning out great. I hope so. I am going to give them a go. Hi Kim, no baking soda or powder is correct! It’s what makes them nice and chewy and taste non-cakey. Enjoy! Hey Jen! Yes just replace all of the almond extract with vanilla! I obviously did something horribly wrong. This is the only sugar cookie recipe I have ever made that came out like rocks. Guess if you would dip them in milk they would be edible. I’m so sad to hear that Donna! Any idea what went wrong? My friend made these the other day and accidentally left out the sugar. Tragic!! Hey Kara! The cream cheese is baked into the cookie, so no need to refrigerate. Great question! If the cream cheese were in the frosting, then I would say refrigerate. I made these cookies, but I cut the salt in half. They were delicious. I also tried making them with lemon extract because I was out of vanilla and almond. Also very good. Thank you for the great recipe. It’s a keeper. Love the lemon extract idea! Thanks for the tip Angela! This was our 2018 Christmas Cookie of year. They were so delicious and soft and the Best Buttercream Frosting made them sooo good. I baked mine 11 – 13 minutes and they were perfect. Thanks again, Karen. Thanks for this amazingly delicious recipe! It was so easy to follow your instructions and they turned our perfect with your buttercream recipe. I was skeptical that they were going to taste undercooked when I took them out so early but they just tasted amazing! Thanks! I’m so glad the tips were helpful Debra! I spend a lot of time writing out detailed posts so I’m glad to know it’s appreciated :) Thanks for commenting! Just made them today with my daughter and 22 month old granddaughter, she handled the sprinkles. Easy to make, held their shape beautifully. Sadly for me the almond extract taste is overwhelming. Will probably cut it out completely for the next batch. Yessss another salt lover :) I’m glad you liked it Michelle!! You mentioned cream in the buttercream frosting for the soft sugar cookie. What kind of cream or what do u mean? I want to make sure I do this right. Hey Kathy! I used heavy cream, but any type of cream will work. You can also use milk in a pinch. Enjoy! Hello! I was wondering if I could freeze the dough for a couple of days before baking it off? Thank you! I cannot wait to try these! Hey Natalie, yes absolutely you can freeze it! Let it thaw in the ziplock in the fridge over night. I see it calls for salted butter and added salt in recipe…is there a certain kind of butter or salt you use so they are not too salty? I have never use salted butter in a sugar cookie recipe before so just wanted to confirm! They look delicious! Hope to try them today. Hi Stacy! I always use salted butter, but you can totally use unsalted butter if you like! It’s just a personal preference. Is the almond extract amount an important ingredient ? I want to add less as last time I didn’t like that taste. Absolutely Lorrie! Replace all extracts with whatever you like best, use the same amount of liquid. Just add vanilla in it’s place. 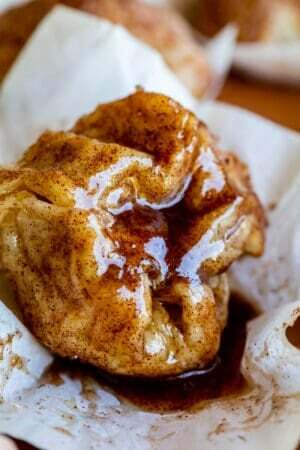 Can you do a rolled or drop cookie with this recipe? I happened to be making these last night for my daughter’s Christmas party at school, and I dropped a couple on the pan to see. As expected, they remain as little mounds that do not spread. There is no leavening in this recipe. So you will get very thick cookies. Best soft cookie recipe! Delicious! Soft, thick and best flavor. I kept the icing on the thin side, my preference. Everyone enjoyed them. Thank you!! Thank you Alice! I’m so glad you liked them! I too love a soft sugar cookie! I have used the same recipe for 25 years from a friend and I absolutely love them, they melt in your mouth. This Christmas I will try yours, I like the idea of cream cheese in it. We will have nine grandchildren and all the adults as well to enjoy these!! Ok! I made double Bach of this and WOW!!! The dough was perfectly smooth and the instructions were easy to follow. Making a double batch made it so I did not have to split up the butter or my cream cheese. It was simple and quick! My dough is chilling right now andI am excited to bake up cookies this afternoon for my kids to decorate tonight. Great idea Jenie!! Why don’t I always double this?? more cookies please! this is a good recipe but make sure an do not over cook …and roll them thick to cook…i made a batch and rolled the first one little to thin and had brown edges so these were not as soft…the next batch i made thicker and pulled out just as they started to get brown…frosted with whipped butter/cream cheese n powder sugar frosting…no vanilla and put in zip bag once cooled and they are really soft and tasty..
I’m assuming all purpose flour? But there is no baking powder, soda or salt? Hi Karen! Yes all-purpose flour. And no, don’t use baking soda or powder. There is a teaspoon of salt called for in the recipe. 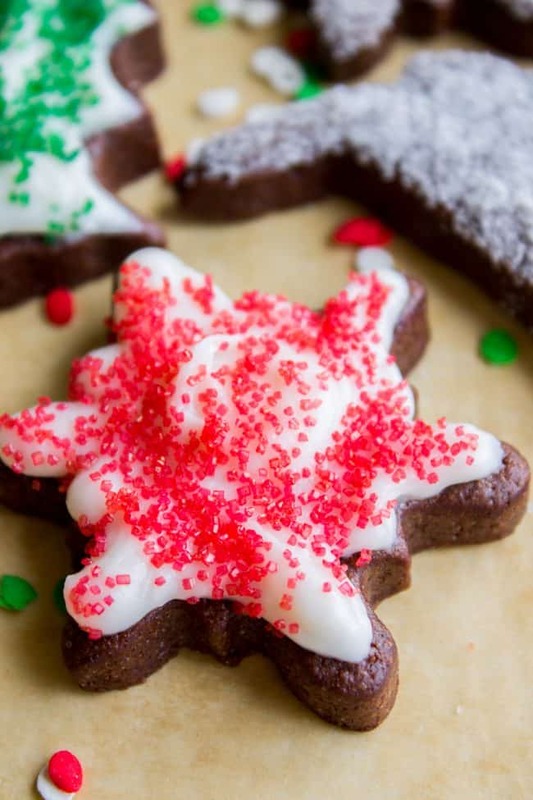 So this is by far the BEST shaped cookie recipe out there and the frosting…YUM! I have a request. I would like to make gingerbread men but the recipes I have always get crunchy on the edges, even when I under bake and they dont hold their shape great. 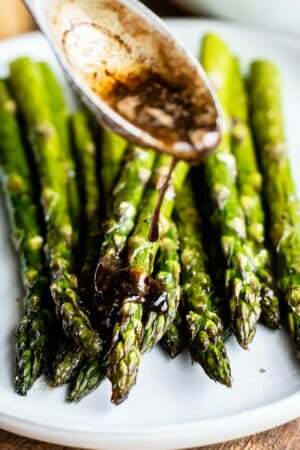 I was wondering if there would be a way to adapt this recipe to include molasses and other spices. I know I can always cut out sugar cookie men, which is what I’m going to do this year (and make those most recent molasses cookies with peppermint icecream, of coarse) but I would love to have a great gingerbread recipe in my cap. If you feel a challenge, it would be appreciated. I tried this recipe yesterday — followed it exactly as written. Even chilled over night well into the next day. When I went to roll the dough out it was SO sticky it stuck to everything no matter how much I floured my surface, rolling pin, and hands. I even went back and tried to freeze the dough and roll out between parchment paper.. again.. too sticky. Stuck all to my floured cookie cutters and the parchment paper. The dough is tasty so I was really hopeful this recipe would work. Hey Kelsey! I’m so sorry it didn’t work out for you. This is a very popular recipe and I know hundreds of people have made them, so I’m wondering what went wrong? It sounds like adding more flour would have solved your problem, and if this happens again, I would definitely try rolling them out on a floured surface. Have you tried freezing these cookies after they have been baked? With or without frosting? Would they thaw just as soft? Hey Melanie! I haven’t frozen the baked cookies, I usually freeze the dough. But I think it would work out just fine, as long as you sealed them well and didn’t freeze for more than 5-7 days. Let me know how it goes! Hello! About to try these (so excited!) and was wondering, if I don’t have parchment paper or a baking mat, should I grease the cookie sheet or not? Hey Kara! I haven’t tried it. Greasing the cookie sheet can cause the cookies to spread. I recommend parchment paper for the best results. Hi do you have an adjustment for high altitudes? I agree Ashley, rolling it out thick makes a huge difference! I’m so glad the recipe was a success! 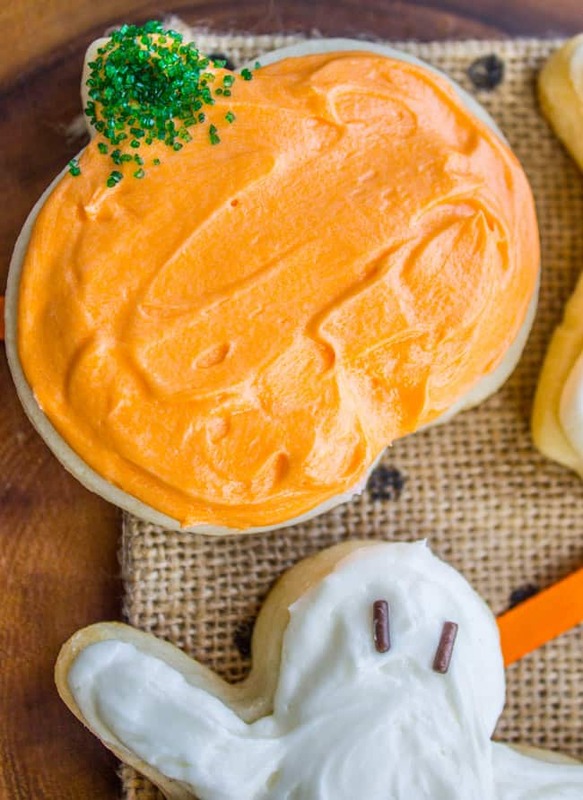 There is nothing better than a soft sugar cookie and the best buttercream frosting…yum, now I want to go make these. Thanks so much for taking the time to comment! It makes me smile! hey Jenna! I’ve never tried it with sour cream, but you could certainly give it a shot. I can guarantee amazing results with the cream cheese though :) Let me know how they turn out! Made these today and they were GREAT! They held their shape perfectly! The only thing I’m going to change next time is the amount of salt – I’m going to use 3/4 tsp instead of 1 tsp. Hey Alice! Definitely don’t skip it! If you want to replace it I would just use an egg replacer or look up how to replace one egg with flax. Let me know how it goes! Thank you for sharing this fabulous recipe. My grandson and I have now made these cookies 4x in the last 3weeks. He loves baking with Nana!!! Now that Easter is upon us we are eager to make them again. Thank you again memories are being made and lots of happy joyful moments with the light of my life. That is so sweet Christine! I’m so happy you and your grandson get to bake together in the kitchen! You are doing it right :) Happy Easter! Hi Karen! These look amazing! Do you think I could use gluten free flour? Thank you! Hey Carly! I’ve never tried it! Let me know if you try it and how it goes! Hi! I am so glad I found this recipe! 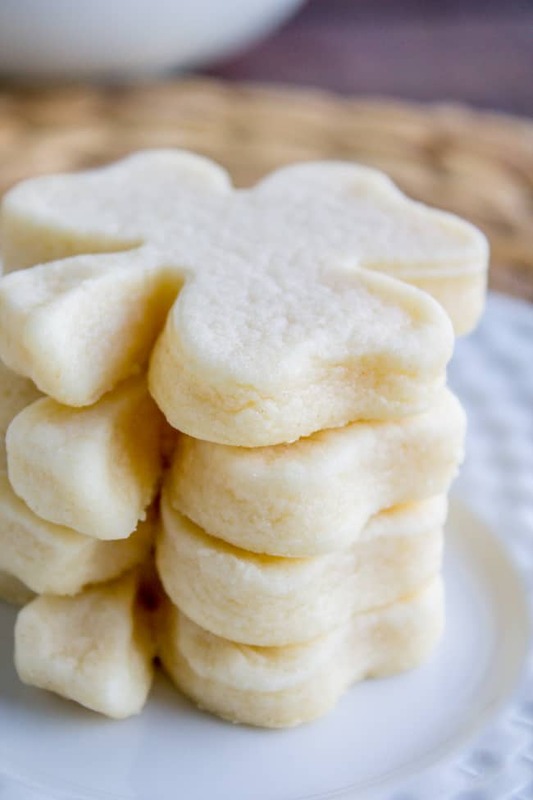 I’m making sugar cookies for Christmas and I can’t stand crunchy cookies, so these seem to be exactly what I’m looking for! I was just wondering if after I decorate them with the buttercream if it would be okay to stack them on top of each other (without the decorations getting too messed up). Thank you!! Beautiful cookies & thanks for the recipe! I’m making these tonight & was just curious why there is no baking soda or baking powder added to this recipe? Hey Isabelle! Because we don’t want them rising. no rising agent makes for a thick, soft, chewy cookie! The flour makes them rise a little but not too much. Hope this helps! These look soooo good. Soft cookies all the way! I don’t have room right now in my kitchen to roll out the cookies. Do you think if I roll the dough into a log and chill it, cut the cookies 3/8″ and bake them, they’ll turn out? Thanks! Hmmm I’ve never tried it Kelly! You will have to let me know how it goes! I made these cookies this weekend since my husband has been nagging me for Christmas cookies. I, like you, love a soft sugar cookie over the hard kind. I followed your recipe and the cookies came out AWESOME!! I only made round cookies this time, but I was very pleased that the cookies held their shape, no spreading and w!ill be perfect with shaped cutters! The icing was great too! I will probably use a little less almond/coconut extract as my husband is not a big sweet fan, but loved them. YAY! So happy to hear you and your husband loved them Kelly! Soft sugar cookies for life! Thank you so much for coming back to review. You have no idea how much it means to food bloggers! It’s like a Christmas present :) Happy cookies and merry Christmas! Love the sound of these! = ) I may have to add them to my Christmas cookie repertoire. 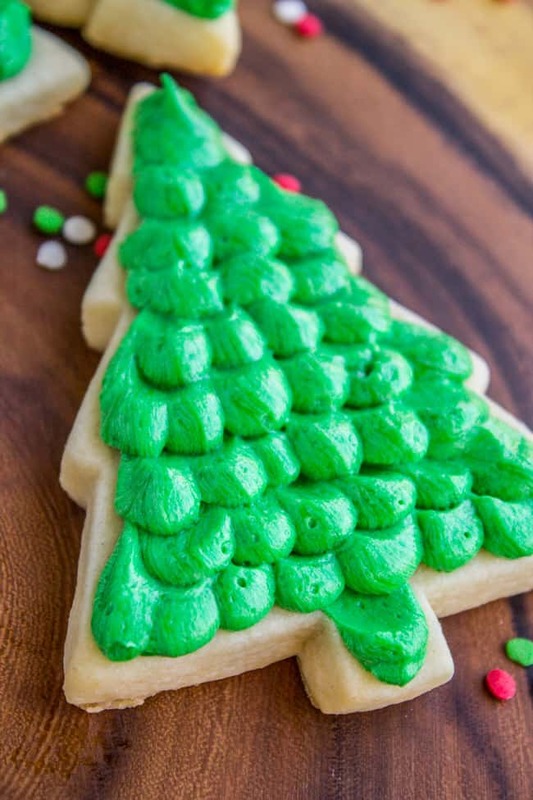 I was wondering what decorating tip (if any) you used to get the effect on the cookies. I used this recipe at Thanksgiving, and they turned out great. I made another batch yesterday and baked them this morning. This time, they spread and flattened out … I’m devastated! I don’t know what I did wrong. I refrigerated the dough over night and refrigerated the cut-out cookies before putting them in the oven. I did done the batch this time, could that be a problem? Or, is it possible to over-beat the butter/sugar mixture?? That was supposed to say that I made a double batch? I’m guessing I can keep the dough chilled for a few days or so before making the cookies? Thanks in advance! Hey Jen! Yes totally! I wouldn’t go more than 2-3 days or I imagine it would get dried out. Throw it in the freezer if you need to do it more than 3 days! I am wondering what the different between almond flavoring and almond extract? Which would be ideal for these cookies? Hey Diana! I always use almond extract! Hey Isabelle! If you follow the directions exactly they should stay soft for at least a day or 2. Keep them tightly covered, even after frosting them! I made these cookies for my daughter’s confirmation. They were absolutely the best! Yay! I’m so happy they turned out Kim! Congrats on your daughter’s confirmation! I tried this recipe today and the cookies turned out PERFECTLY! They seriously taste just like bakery cookies-very impresssive. Thank you for sharing! I am making these cookies for my daughter’s wedding. I want to just put decorating sugar on them. (Not enough time to ice them) Did you brush them with water and sprinkle with sugar after baking? Hey Greta, yes that’s exactly what I did! use only a very small amount of water. Use a pastry brush with actual hairs (not the kind with rubber or silicone brushes, you know the ones?) I would brush with water and then dip in sanding sugar, that will get better coverage. Let me know how it goes! Happy wedding, congrats to your daughter! 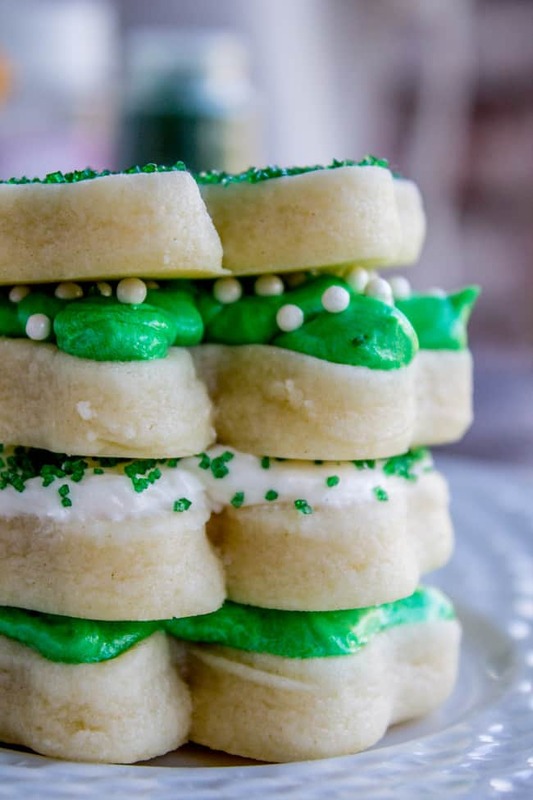 Have you ever made this with 1/4″ cookies instead of 3/8″? Love this recipe but looking to get thinner and more cookies out of it. Would I reduce baking time at all? No I never have Lauren! It will work just fine, and yes I would reduce the bake time by a few minutes. You will just have to check it. Let me know how it goes! Hey Kristen! Yes you can freeze the dough. I just put it in a ziplock. I’ve got some in my freezer right now! These look amazing! But I have a hatred for almond extract. If I leave that out, do you suggest I replace it with anything, or increase the vanilla? Yo Vanessa! Who doesn’t like almond extract?? Weirdoooooo :) Yes, just up the vanilla to replace the almond. They will still be delicious! Enjoy! I stumbled upon this recipe while attempting to make sugar cookies for the first time. Wow! These are absolutely delicious, and the almond extract shines through brilliantly!! I was a little nervous since my dough wasn’t too sticky, but they turned out perfectly. Your directions are so clear and easy to follow. 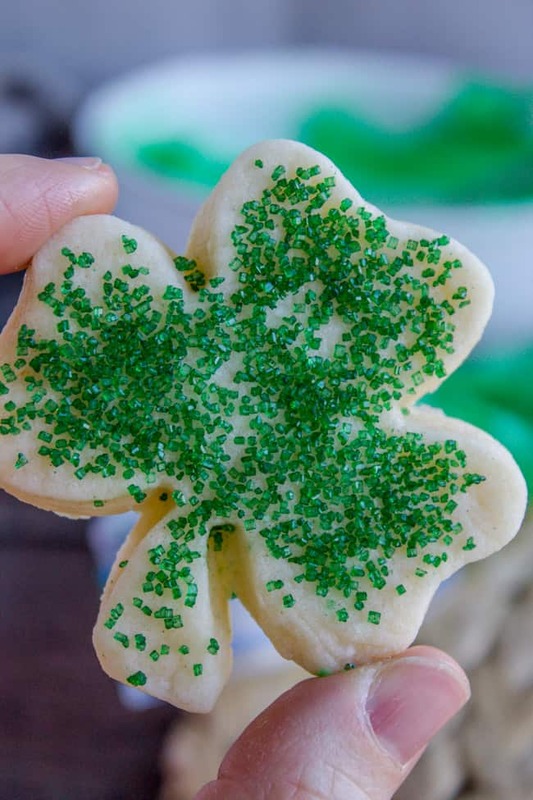 This will be my go-to recipe for making sugar cookies in the years ahead for my family. Thanks for sharing! Thank you Lindsay, that’s such a huge compliment! I hate vague recipes :) I’m so glad you all loved them. I am totally craving these now! Thanks so much for the review! I just realized you asked me about sugar cookies a while ago and I never responded! Sorry, looks like you found a good one. These look very similar to mine, I like them thick and soft as well. Ooh Karen, I so need these! I’m totally with you in the fact that I prefer my sugar cookies soft. :) Definitely going to make these soon, and I also can’t wait to see your frosting recipe! I am a sugar cookie SNOB! And these look amazing!! I also love a soft cookie with sweet frosting. Those fancy cookies with royal frosting decorations are beautiful, but usually are a disappointment to munch. Give me one of these any day! I may have to try this recipe for Easter! Thanks Debbie! Long time no talk, how are you? i was just checking out your friend’s soup that she guest posted, looks good! And I agree, there’s nothing more disappointing than a beautiful cookie that tastes like cardboard! Let me know if you try them out! Have a great rest of the week!